I stumbled upon Trevor back in 2011 on SkillShare actually. Saw a class below $10 and decided to give it a go and that was indeed my first SkillShare class. When he mentioned he had this Lean Startup Machine weekend, I was like oh bummer, but I got no idea and money to attend the class. 3 days before the actual weekend, a lightbulb lit up. Volunteer as a helper! Bingo! That was how I attended Lean Startup Machine for free (shhh…). I shot Trevor an email and he replied just one day before. Yup, to validate the idea, get out of the f***ing building. Cause there’s no point stayng in house and doing your own research when you do not understand customers’ needs and wants. To validate your learning is to ask the right questions. Keep them as neutral and as open as possible. Answers can go either way, and always ask why! Best part is if you get the right customers and they actually know what they want. It helps you to give you lots of clarity for your validated learning. Yup, like Steve Jobs said, customers sometimes do not know what they want/need. And that’s usually tough, but if you can provide a solution to that unknown need/want, you will get a bingo. Let’s face it, you are doing a business anyway. Payment is a big validation point for your business. If people are not wiling to buy, then you got to figure out what value to provide them to get their payment. Returning is as big of a learning as paying, cause getting loyalty in the long run would transcend into recommendation to others. Eat, Drink, Rave Develop your MVP, test it out, validate it with customers and then repeat. Sometimes along the way, when your business do grow, you tend to forget this process, but it’s such an important tool to know what works and what doesn’t. Don’t be afraid to pivot if you hit a brick wall. Pivot is sometimes the ultimate move that could decide on whether you gain traction or not. Er, yeah. Fail faster, cause the faster you fail, you faster you can move on what works, by knowing all the things which are not working. Practice this in any industry. Starting lean is so much easier than below. With rising cost, co-sharing everything is now very common. All you got to do is to innovate. Yep, it’s been that soon since myBurgerLab hit the first 365 days mark. It has been an unforgettable eventful year. Seriously, the insane-ness of how things have revolve still caught me jaw drop. Started with uncertainty, fear, with sometimes fake confidence has now evolve to commitment to create and make a difference to many. The journey of an entrepreneur is really not a joyride and the prices that one has to pay is sometimes a lot. My friend, Aaron Hee, sent me an article once which very much relates to what we called ourselves sometimes as Entrepreneurshit. To be honest, the E word is just a term. It’s your actions in the end that counts. Of course you will feel afraid, fear, uncertain, with all the what-ifs flocking into your head whenever you feel like doing/creating something. But I guess if one does not want to regret of not trying over one’s death bed, then all these adrenaline of fear will turn into “Screw it, Let’s Do It” and see what happens. If you ain’t dead, there’s really nothing much worse in life. Look at Nick Vujicic! We just have to stretch ourselves and break through that resistance to see how far we can go. Cleaning the grease trap was definitely a breakthrough for me and I always believe if I can do that, I can do anything. I’m thankful for meeting 2 great partners in this course of my journey. Having gone through ups and downs from the times we had at Red Bean Bag to what we have today is just one hell of journey. We still joke about the burnt buns that we did at Red Bean Bag and how we had to work till super late in the first week of opening. Fun memories, tiring ones though. Sure, there’s always bound to conflict at times, and I guess that’s how we get to know each other better and learn to grow. I believe the key for us to really to focus on things which are bigger than ourseleves – customers, staff, community. I always mention this to my friends, the best joy I have at myBurgerLab (apart from serving customers) is seeing who my staff has become ever since the first day they stepped into our team. Their willingness and drive to learn, build their character, provide good customer service, improve themselves and also the process, create different flavor burgers, create piece of art, contribute to the economy, and to work hard and play hard at the same time. With the average age of 23, these Geeks (that’s what we call ourselves as here at the Lab) will go far in life with these qualities in them. The next 365 will be a very challenging one. Statistics has shown that 70% of startups never get past their 3rd year and half of the survival will get made through the 5 years. We definitely want to be longer than 5 years to create a community business which thrives on good food and service with awesome staff. Without any working experience of more than 6 months in a single corporation, everyday is a new learning experience for me, especially when it comes to managing people. My 2 month experience in Piceri (headhunting) has definitely thought me how to search for talents, interview candidates, screen through them, develop them and to really see that jobs creation can really make a difference to a lot of people out there. Then came the 4 months stint at PwC where I learnt about the accounting process and controls to kickstart BurgerLab’s backend. I guess the long hours in the audit line did also prep me to cope through serving in an FnB outlet. @auditors – if you think Audit is bad, try the FnB industry. The next 6 months advertising internship at Wunderman,NYC was a fruitful one. The biggest learning I get from working in Wunderman was really seeing through how companies are actually willing to spend a potload of money for results which they do not have control on and it’s really left to fate which hopes that the Ad campaigns can make it. Since then, I always believed that if that cost is to be put into staff training and product development, it would be very much well spent. And I have to thank Trevor Owens and team for teaching me the Lean Startup Methodology – the biggest takeaway I have really gotten from NYC, which then we applied it into myBurgerLab. It’s definitely a weekend well spent there. And I have to say, the energy in New York is really intense. Coming back here back then feels so much different. I shall part now by saying thanks to all our customers for the support, our Geeks for the awesome hard work, all the people who mentored me before and made a difference in my life (especially you Milestone folks 😉 ) and my family for supporting me into this. If you have something in your mind and you have yet to start, my advice would be stop “Mind Mastrubation” and just take action. Six simple words to ask yourself – “What are you committed in creating” and it will lead the way. Probably the 2 most important elements in any relationship, be it in business or personal. I have to say, I have learn really a great deal of these 2 elements. In business, sometimes you just have to trust the other party that what he/she is planning to do is for the good of the business. We sometimes just have to let go as a partner and trust that the other party can do it. It’s part of a management style – autonomy, rather than being a micromanager. As for honesty, it is very crucial in business. It’s better to be transparent rather than hiding, even if your ideas or thoughts are to be shot down. You just have to admit that you’re wrong if it is bad one. That is what the so called brainstorming is. If you can’t have trust and honesty in a business, I would highly advise you not to go forward. Until you can accept the presence of these 2 elements, it will be easier for things to move forward, saving you a lot of time…. Had a great lunch with Mr. Ross Chia, a name that many would be familiar with if one is from the Malaysian Telco Industry during 1995 – 2005. Ross started his career with P&G before moving to Maxis in 1995 when it all began. His people skills had lead him to set 5 big records in Maxis, helping them to churn out profits by the 5th year. His presence in Maxis has changed the perception of many that a person with FMCG experience can definitely handle the Telco world. He used his own 5 marketing strategies (hence the 5 fingers) to penetrate the market, especially during the 1998 crisis, to compete with Celcom back then. His secret has always been his motivation skills and warmth towards people. When I first known Ross one and a half years ago, he is definitely one of the nicest boss I have ever seen. My colleague, Andrea, nicknamed him the Angels without wings. During our lunch together, he mentioned his first book was Dale Carnegie’s awesome How to Win Friends and Influence People, which lead him to be such a great leader. That is definitely a good buy, believe me. I really appreciate what Ross taught me during lunch about Sales and Marketing. Understanding one’s target market is really important and he taught me few things for my new venture, myBurgerLab. Will definitely keep those in mind. Woke up 6am in the morning to get some things done before heading off to Singapore today. Last night was great with 5 people came for our testing. Yes, testing our prototype, that is what all startups should do as soon as possible. 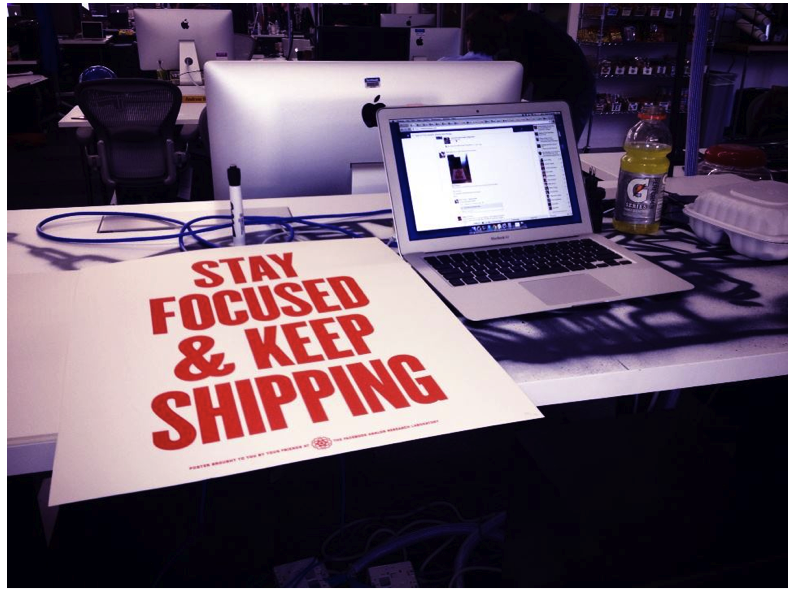 The key here is to start small, but ships fast. By doing this, startups will then learn what needs to be tweak from what failed and what not. After every tweak, it’s essential to continue to ship. Just “keep shipping”, that is what Mark Zuckerberg put on his desk to keep him focus. So keep that in mind when a billionaire tells you that! Failing Fast. That is the key now in every entrepreneurship startups. Failing has never been a good indicator for the current century. With the Internet available now, startups can perform numerous tests to validate their hypothesis and learn from it. If you are not failing, you are not learning. Hence, I rather fail fast in the start before investing a pot load of money into any business without knowing how the business will take off. Take your traditional hats off and go out to do all the testing you can. Set that for your goal this year!